Proper pool bonding is an extremely important topic. The number one concern of any professional installer has to be the safety of all pool swimmers. Most of us are aware that the pool must be bonded, but since 2008 the National Electrical Code (NEC) has mandated that pool water shall be electrically bonded, not just metals in the structure of the pool itself. NEC bonding requirements apply to in ground and above ground pools, and includes all metal components, equipment and the water itself. Correct pool bonding protects people, pets and pool equipment. Code enforcement for these requirements is consistently increasing. No matter how the code is enforced in your area, safety MUST be the highest concern. Successful pool professionals should already be meeting these requirements for all pool service and installations. CMP has been at the forefront of this area, developing products that are designed to make proper water bonding an easy and cost-effective addition to the construction of every pool. Bonding is defined as: ” . . .the practice of intentionally electrically connecting all exposed metallic items not designed to carry electricity in a room or building as protection from electric shock.” (Wikipedia) Another way of putting it is that the primary purpose of bonding is to keep people and electricity separated. 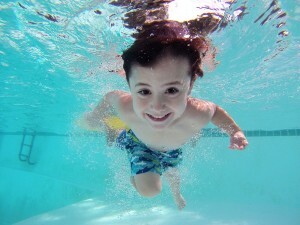 Stray currents (or electrical gradients) can occur in a swimming pool. Every metal component, the pool water and your body are all conductive and will carry electricity in the right situation. In an improperly bonded pool stray currents are out of control and will seek the easiest path for conductivity. A bonded pool balances the electrical pressure and keeps all currents flowing outward into a bonding wire or grid where they are safely dispersed. Pool electrical safety is the most important thing! 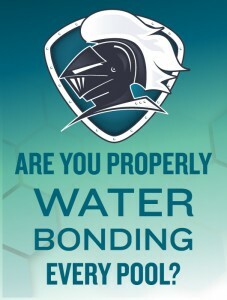 Complete the form below to for more info on water bonding devices from CMP. NEC stands for National Electrical Code. The NEC code is maintained by the National Fire Protection Association and designed as a guide for knowledgeable trade professionals. It is the basis of code requirements for most jurisdictions. It is not on its own a federal requirement and adoption rates for NEC code updates can vary, so it is important to be aware of your local requirements as some may actually exceed requirements of the NEC. WHAT DOES THE NEC SAY SPECIFICALLY ABOUT WATER BONDING? You don’t want this in your pool. Proper bonding keeps people and electricity separated! WHAT CAN I USE AS A WATER BONDING DEVICE? You can see the minimum requirements above. The three keys are: minimum of nine square inches on conductive material, constant contact with the water and a secure connection. Traditionally the most common “bonding device” has been the pool light itself. Common pool lighting is housed in a metal “wet niche.” As a metal component the light must be bonded, and by creating a wet niche bond the pool water itself is properly bonded. The good news is that according to NEC 680.26(B), the water bond device can consist of other metal parts that have already been properly bonded, so Bob’s your uncle! But as you may know, pool lighting has changed a lot in the past five years. Plastic wet niches and completely nicheless LED lighting have become extremely common. In fact, some industry statistics show nicheless lighting slowly gaining on traditional wet niche pool lighting. One major upshot of this is a change in pool water bonding. If you have made the switch to nicheless lighting or plastic niches with no changes to how you are bonding a pool, then that pool is not safe! Unfortunately, you are not properly water bonding the pool. Once the metal wet niche is no longer available as a bonding device solution, you must find an alternative. Fortunately there are options available that can make this an easy and cost-effective addition to pool construction. CMP offers a growing suite of products as part of the Pool Defender™ product line. These products are all ETL Certified to UL and CSA standards. Currently CMP offers four different water bonding solutions, two primarily for in ground pools and two that are perfect for above ground pools. These products are the Pool Defender Water Bond Skimmer, Inline Anode & Water Bond, Pump Water Bond and Econ Union Water Bond. This is the newest addition to the Pool Defender family. The Pool Defender Water Bond Skimmer is the best option for new construction pools to add water bonding. The water bond skimmer has a built in stainless steel plate that is mounted safely behind the pool basket. An embedded copper wire exits the back of the skimmer and is perfectly located for connection to the pool bonding wire or grid. This skimmer upgrade couldn’t be simpler. With this method you can install the in ground skimmer exactly as normal, and the bonding connection is perfectly located for a convenient connection. 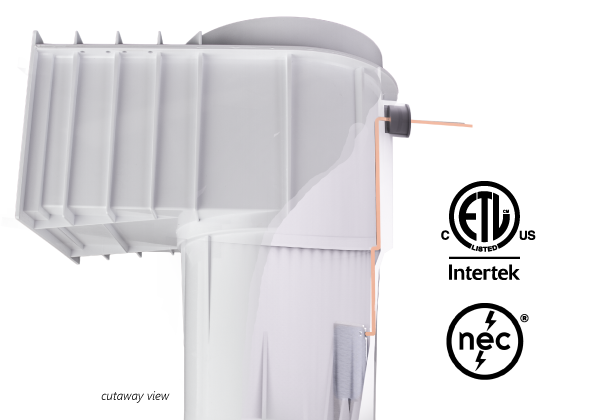 Multiple models are available to meet your pool skimmer requirements. Check out all current available models. 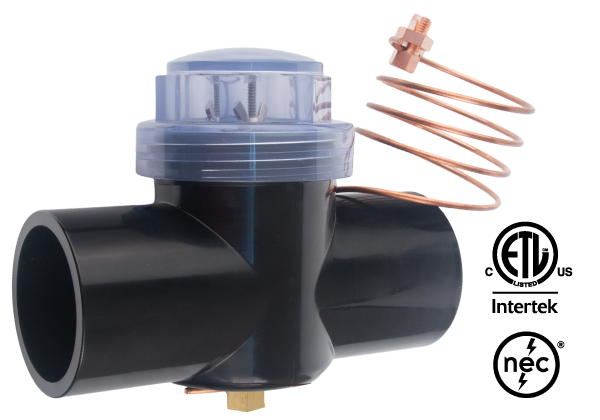 The Pool Defender Compact Anode & Water Bond installs inline with the pool plumbing. This combo unit has a steel plate that bonds the pool water as well as a sacrificial zinc anode that helps to reduce galvanic corrosion in the pool. This is a perfect product for pools using a salt chlorine generator. There is also a clear lid that can be easily removed to access the anode or bonding plate. With this bonding method it is important to ensure that the pool water always remains in contact with the anode to meet all NEC requirements. Learn more about the inline anode and water bond. This clever device is a quick way to add bonding to most above ground pool pumps. The bond is created by a stainless steel coil that sits out of reach below the pump basket. 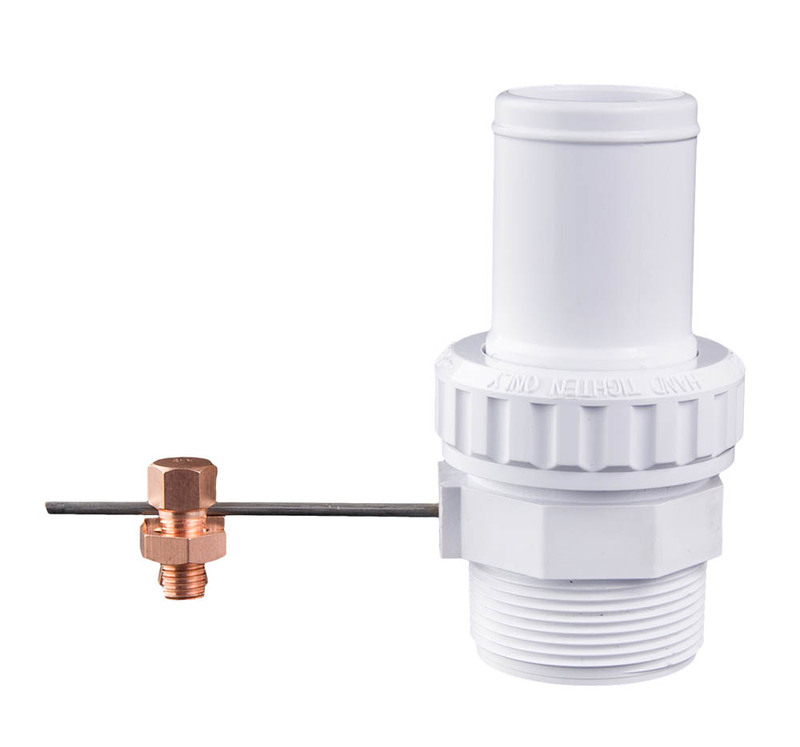 The kit includes a special replacement plug for the above ground pump. The bonding wire exits through the included pump strainer drain plug. An approved bolt connector is included for attaching to the pool bonding wire or grid. Don’t forget: above ground pools are included in the NEC water bonding requirements! This is a a great, quick solution for above ground pools with a flex hose filtration system. The Econ Union Water Bond is integrated into our “econ” style union. The Econ Union is a 1.5″ Hose Barb on one end with a 1.5″ MIP connection on the other. With this union you can install pool bonding to an above ground pool right at the hose connection. No special tools are required for installation. The stainless steel coil is hidden inside the union and does not impede water flow. The included bolt connector attaches directly to the pool bonding wire. Check out the above ground water bonding solutions here. 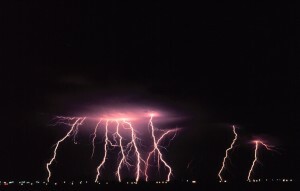 You really can’t mess around when it comes to electrical safety. Unfortunately, there are stories in the news every year about the tragic dangers related to electricity in a pool area. You owe it to your customers to keep their pool safe. The NEC has provided a clear solution for minimum pool bonding requirements. That’s why we say that “every pool needs a Defender™.” Every pool needs to be fun, every pool needs to be well built and every pool needs to be safe. Check out all of the products made available by CMP for water bonding, and contact your CMP pool rep for more resources and information on Pool Defender Products. Complete the form below to obtain more info.